If I Seem Out of Breath, Here's Why. I've been running for the last month. Well, metaphorically, that is. the end of Lap 1* of Finish Year! Anyway, if you're just tuning in, Finish Year is a campaign Jon Acuff has initiated this year as a challenge for his readers to finish a handful of things this year. Not start them; finish them (the hard part). So at the beginning of the year I posted my Finish List. 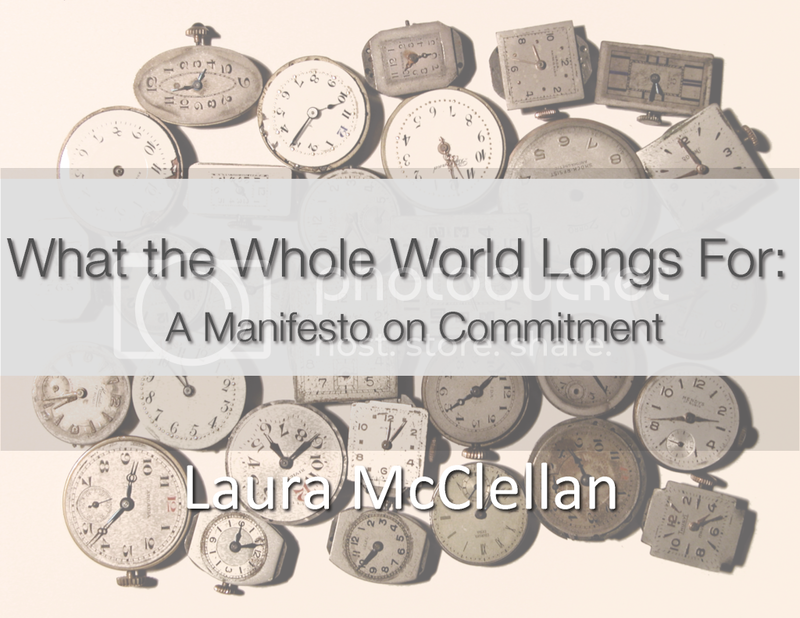 Since Lap 1 of 12 has now come and gone, and many of my goals are writing and/or blog-related, I thought I would do a quick progress report for you. But not the kind that's the report card's less-important cousin you received in middle school, which in actuality had no effect on your grade (and therefore you could not in good conscience be punished for.). *this moniker refers to the first month of Finish Year and is 100% made up by yours truly. Finish List Item 1: Finish "The Empress" by the end of February. I'm on my way to completing this. I posted a new installment here a few weeks ago, and plan on wrapping that up this month. My plan is to finish the rest without posting it online, go back and edit the whole thing for continuity's sake (there are already a few things I want to change), then post it in a PDF format after it's finished for anyone who would like to read it. Finish List Item 2: Write an ebook. This goal is actually going pretty well. I've already got a first draft of something exciting I'm working on in conjunction with my blog, so stay tuned. I don't want to give away what the topic or setup will be just yet, but I'm looking forward to sharing it! Since this ebook is not initially what I had in mind when making it a goal, I'm sure I'll attempt another one after this is complete. Finish List Item 3: Finish the Harry Potter Series. 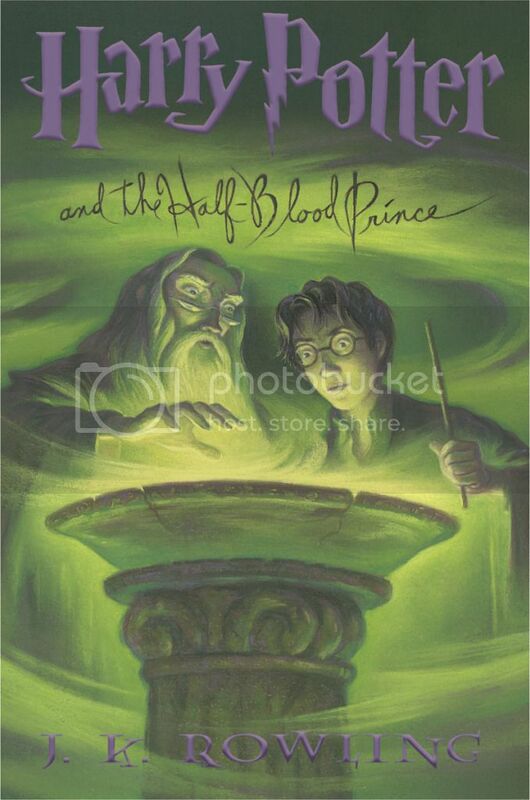 Since the last time I wrote about this, I've finished the third book, Prisoner of Azkaban, and I am about three-fourths of the way through the fourth book, Goblet of Fire (which is significantly longer, if anyone is doubting my already-pretty-slow-paced reading skills). Yes, I am a grown up and still openly carry this to work every day (so as to minimize shoulder injury from stashing it my purse). 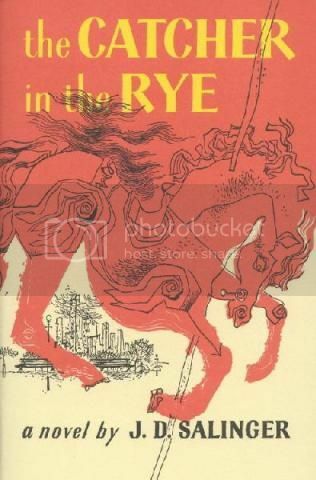 Finish List Item 4: Read two other books besides Harry Potter. I'm trying to finish Harry Potter first before I start on any other books, so this one is in the queue. Though I have an increasingly long list of books calling my name. Overall I feel like I'm doing pretty well, but I definitely have to start moving on the first one. How's your finish list (or resolution list, or goals list) going so far? Look how excited we are to own it! Her name is Jackson Pearce, and she writes young adult fiction. I read her first book “As You Wish” last year and couldn’t put it down. I haven’t read her second book “Sisters Red” yet, but I will definitely be doing that soon. I hear really great things about it! 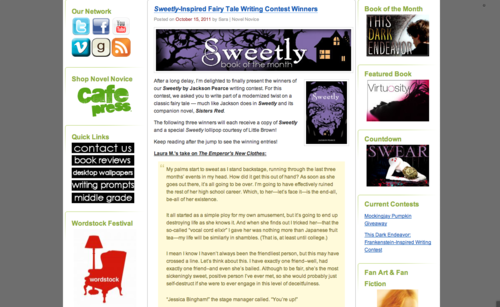 A website called Novel Novice is currently holding a writing contest in conjunction with the release of “Sweetly” that asks participants to write and submit the beginning of a story—a modern twist on a fairy tale. I thought this would be a great opportunity to practice writing, give me a deadline and goal to work with and also give me some direction by laying out a topic to start with (since I usually just sit there wracking my brain for hours trying to come up with a good potential storyline and don’t come up with anything I haven’t already written about). Win, win, win. If you would be interested in reading more of the story, let me know and that will give me an excuse to finish it. :) Click “read more” below to read my story. 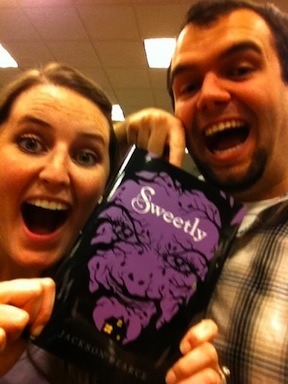 You can order “Sweetly” by clicking here or buy it in a real live book store! (It’s still release week which I now know is a big deal so buy it this week if you’re going to buy it!) Follow her on twitter: @jacksonpearce. My palms start to sweat as I stand backstage, running through the last three months’ events in my head. How did it get this out of hand? As soon as she goes out there, it’s all going to be over. I’m going to have effectively ruined the rest of her high school career. Which, to her—let’s face it—is the end-all, be-all of her existence. I mean I know I haven’t always been the friendliest person, but this may have crossed a line. Let’s think about this. I have exactly one friend—well, had exactly one friend—and even she’s bailed. Although to be fair, she’s the most sickeningly sweet, positive person I’ve ever met, so she would probably just self-destruct if she were to ever engage in this level of deceitfulness. Oh God. She’s up. In just a few short minutes, the whole school is going to know that Jessica Bingham, Moorestown Academy of Performing Arts’ newest celebrity, sings like a bag full of stray cats being slammed against a brick wall. This never would have happened if her asinine friends didn’t go along with every lie that rolled out of my mouth just to be shielded from her wrath. You sound great, Jessica! You have to make a cd, Jessica! Where can I buy those pants, Jessica? Okay, that last one was beside the point. But if those psychotic clones didn’t worship the ground she walks on and encourage her to sing tonight even though they know darn well she still sounds like a cow being run over by a speeding train, this whole operation would’ve been shut down right from the start, allowing me to go right back to the life of invisibility I always wanted. So really, this is their fault. Too late now. The track has started. I can’t look. No—I can’t listen. I need to leave. As I turn to my left to try to make a quick escape, my face suddenly collides with a cinderblock wall of a man apparently named Phil, according to the name tag that was now endangering my cornea. “Hey, uh, isn’t that the girl you came with on stage?” he pointed to Jessica, who was busy motioning at the sound guy to turn the music up in the monitors. “Oh, um, well…” was all I managed to get out, because he spun me around and pushed me towards the side of the stage. “Good thing I caught ya or you would’ve missed the whole thing!” he chuckled politely then shuffled off, mumbling into his headset. Awesome. Now I am forced to watch this train wreck first hand. I cover my eyes, leaving only a small crack between my fingers to peer through. Jessica and I simultaneously take a deep breath. Here we go.